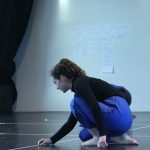 Louise Nicholas undertook a student placement with Dance4 in December 2018 as part of her dance degree course and she sent us a short report and pictures that she took, featured on this page. 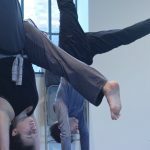 Thanks to our residency artists Bakani Pick-up, Feet Off the Ground and Katye Coe for supporting the placement. 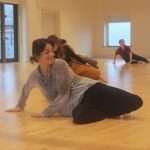 “I am currently a third year student studying Dance & Choreography at Falmouth University, and as a part of our final year we have the option to go on placement to research into some enquiries. 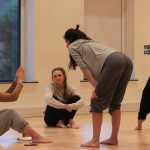 After having a film module in second year, I became highly interested in film and more specifically, how film interacted with dance. During my time at Dance4, I have been able to take photos and footage of various things that artists have done. The majority of the footage comes from company classes which takes place in the morning as well as getting footage of more behind the scenes things like development processes. 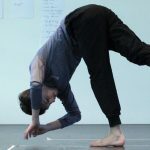 I managed to video three different company classes one of which I was able to partially take part in, which I felt was quite nice as it didn’t completely alienate me from the class and I managed to experience part of Katye Coe’s class. I also have been lucky to get footage from development processes for Feet of the Ground. As well as seeing things develop and see what directions the artists choose to take, I found it really enjoyable to take part in the workshop that Feet of the Ground put on, I found it interesting to see what they created to put into the workshop and then what they created as a result of the workshop.